The internal intercostals (Wikipedia) are muscles that are on the inside of the ribcage, mostly on front, around the sternum, and out to the sides. They are in between each rib and the one beneath it. These aren’t casual, every-moment-of-every-day breathing muscles: they’re used primarily for “forceful exhalation” like when we sneeze or cough, or when we’re trying to get every last molecule of air from our lungs. Sometimes that happens when we mismanage our breath usage, and end up trying to complete a thought without taking another breath. The internal intercostals, and the tranversus thoracis which are on the inside of the bottom of your sternum, can be engaged by exhaling most of the air that you currently have in your lungs (why not try it now!) 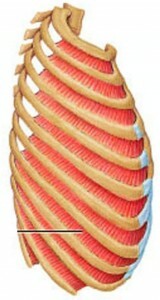 and then gently “coughing” which will contract these muscles and pull your ribs down and your sternum toward your spine. Generally speaking, we don’t want to be engaging these muscles on every breath. Better to swing your ribs open on the inhalation and keep the effort of these muscles out of play as you are making sound (aka “phonating”). But sometimes we consciously choose to make a very long breath-thought, to speak for a really long time on a single breath, and in those cases, we’ll need to engage these internal intercostals, and so we’ll want to work to try not to compensate or help out with postural muscles, too. So here’s an experiment for you: exhale a long sustained “oo” [u], and go as long as you can! As you’re “oozing” your way through that breath, feel how your ribs lower, and then how your internal intercostals begin to pull the ribs down and closer together, pulling the sternum closer to the spine. Try to keep going until you feel really empty. Be sure to keep your head-neck alignment floating forwards and up while this internal compression is going on. When you feel completely empty, relax and let the air pressure difference between your insides and the air outside draw the air back into you. Just relax, keeping your throat open, and “let the breath take you” rather than the usual “taking a breath yourself”. As you find yourself full of breath, carefully allow yourself to fill all the way, and image the external intercostals on the outside of your rib cage, which are mostly on your sides and back, to swing your ribs wide while keeping your shoulders relaxed. On an exhale this time, imagine that you’re blowing out birthday candles, LOTS of them. 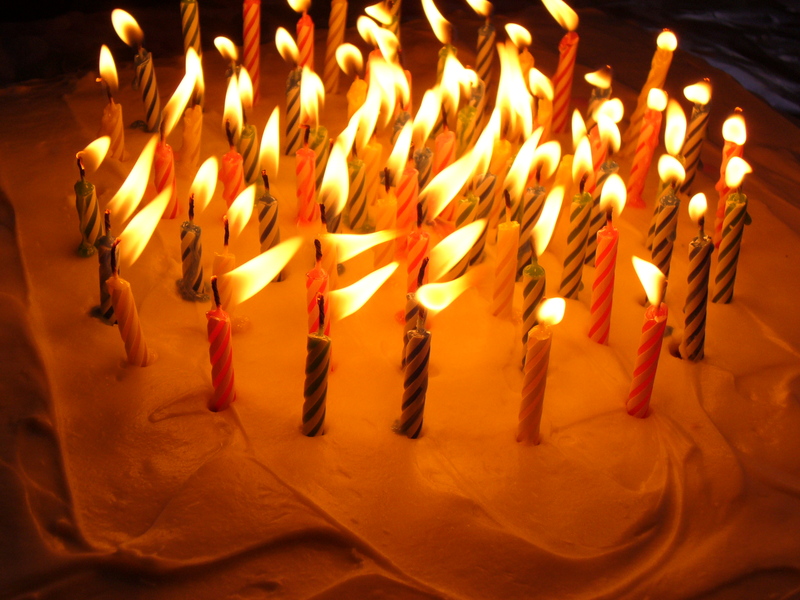 You need to budget your air usage so that you are blowing a slow, steady stream of air across the tops of the candles on the cake, trying to get them all with a single breath. It might help to imagine the cake up at eye level so that you don’t bend over as you’re exhaling. Keep your shoulders wide across the back and the front, and don’t reach forward with your head and neck to reach the cake. Imagine bringing the cake up to your mouth for you to blow on. As you run out of breath on the final cake, visualize opening your throat as wide as is possible, and allow your ribs to swing wide and open. Try to open your throat wide as you do it so that you don’t get any stridor on the inhalation. Activating the internal intercostals might not be on everyone’s to do list for a warm-up, but knowing about how they work and how they might introduce tension into the mix means that you really need to explore them. In my experience, learning how to let them go quickly so that you can “drop the breath in,” while swinging your ribs wide and backward, is the most important learning we can have for this muscle group. For more on the action of the internal intercostals, see the journey of the voice page.